Hard-core hikers might think of Little Si as a desperation hike for the rare occasions when its larger counterpart, Mount Si, is under snow. And indeed, kingly Mount Si looming above is hiked year-round by mountaineers staying in shape for summer climbs. At 1,576 feet, Little Si is not a lofty peak, but it does offer imposing cliffs that climbers practice on; mountain goats are sometimes seen around it and experienced scramblers know a couple different routes to its summit. 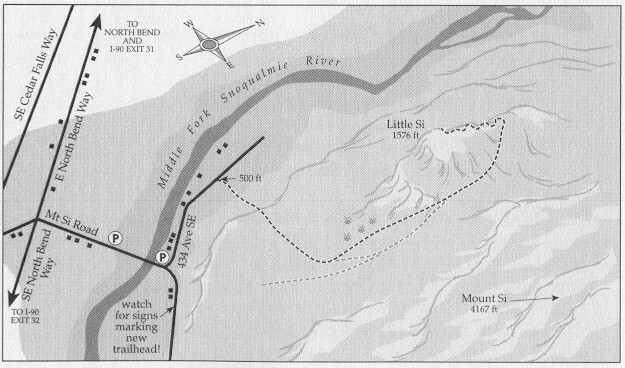 And in 1985, an army of volunteers led by Will Thompson built a new section of trail and improved sections of an old scramble route. So now hikers tackle Little Si in the winter when the wind and/or rain seem a bit much for its popular counterpart above, or simply for a change of pace. And it makes a great hike around the holidays, being close to the city and offering a chance to get out in the weather and work off some calories. 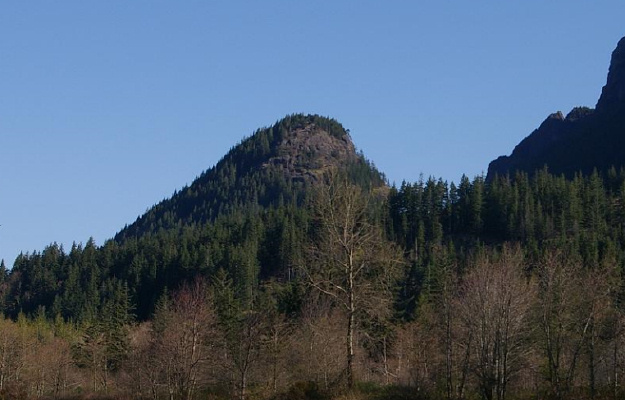 Little Si is part of the Mount Si Natural Resources Conservation Area, managed by the state Department of Natural Resources and created to preserve the area’s natural ecosystems. Little Si is a real mountain and on a windy day it can feel like you’re miles from nowhere, especially near the summit, which is mostly bald and exposed to the elements.